Michael Burns and Trevor Howard of HVGC recently attended the Jr. National Team camp at the Olympic Training Center in Colorado Springs. The JNT is comprised of the top 14 12-13 year olds and top 7 14-15 and 16-18 year olds in the country. 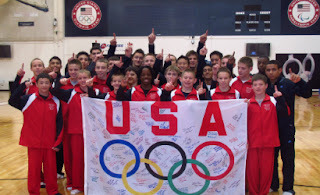 This year, USA Gymnastics is sending a select team of 6 athletes to compete and train with the Chinese Jr. National Team in Beijing, China December 4-12. Trevor was selected to be part of that team. They will train and stay at the Chinese National Gymnastics Training Center along side the Chinese national team. Mid-week they will have a competition with the Chinese team and finish the week out with more joint training.